The film's prologue was 8 years before the action of the main film - with the British vessel the HMS Dauntless encountering evidence of a pirate ship's (the Black Pearl with black sails) attack on a merchant vessel. 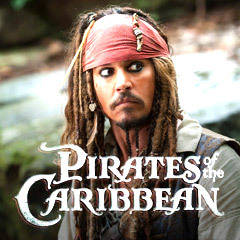 Future characters were introduced: 12 year-old Elizabeth Swann, daughter of Port Royal's (Jamaica) Governor Weatherby Swann (Jonathan Pryce), a rescued boy named Will Turner (with a mysterious gold pirate's medallion with a skull, secretly kept by Elizabeth), and ship's lieutenant James Norrington (Jack Davenport). In the film's main story, Captain Norrington was being promoted to Commodore in the British Royal Navy, and Will Turner (Orlando Bloom) was Port Royal blacksmith's apprentice and expert swordsman, in love with spunky 20 year-old Elizabeth Swann (Keira Knightley). Swashbuckling, eccentric pirate Captain Jack Sparrow (Johnny Depp) arrived in Port Royal, Jamaica, just as his dinghy sank at the dock in the film's clever entrance scene. He arrived just in time to save Elizabeth (with the medallion around her neck, emitting a pulse in the water) who had fainted and fallen into the ocean after the promotion ceremony. Sparrow was captured and locked up in jail, ready to be hanged by Elizabeth's pompous fiancee Commodore Norrington the next day. Meanwhile, blackhearted Captain Hector Barbossa (Geoffrey Rush) and his crew of "miscreants"-pirates from the Black Pearl (Jack's former boat), attacked Port Royal, summoned by Elizabeth's medallion, and kidnapped her. She was mistaken for the daughter of pirate-scallywag William "Bootstrap Bill" Turner, Will's father, when she told Barbossa her name was Elizabeth Turner, and they kept her onboard when she turned over the medallion, and kept her captive on their trip to Isla de Muerta. Will Turner freed Jack from jail to help him rescue his "bonny lass" Elizabeth from the Black Pearl, by commandeering the HMS Interceptor (after tricking the Navy by switching ships). They sailed on to Tortuga to first assemble a motley buccaneer crew before proceeding after Elizabeth. Meanwhile, Barbossa explained to Elizabeth how the medallion was "Aztec gold, one of 882 identical pieces they delivered in a stone chest to Cortes himself. Blood money paid to stem the slaughter he wreaked upon them with his armies. But the greed of Cortes was insatiable. So the heathen gods placed upon the gold a terrible curse. Any mortal that removes but a single piece from that stone chest shall be punished for eternity" - after Barbossa located the chest and stole the Aztec gold coins (and wastefully spent all of them), the ancient curse was placed on him and his greedy crew ("We are cursed men") - they were doomed to sail the seas as living corpses. Tthere was one way to end/break the curse for them: "All the scattered pieces of the Aztec gold must be restored and the blood repaid" - Elizabeth's medallion was the "final piece" or coin to be returned; "the blood to be repaid" meant that Barbossa would use a drop of Elizabeth's (Turner kin) blood on the last coin to remove the curse: "That's why there's no sense to be killin' ya, yet". The pirates were actually 'undead' skeletal beings ("The moonlight shows us for what we really are. We are not among the living so we cannot die"). While sailing to Isla de Muerta, Will learned that ten years earlier, Captain Jack was formerly the captain of the Black Pearl when Barbossa was the First Mate. Scheming Barbossa had mutinied, marooned Jack on an isolated island to die (although he escaped three days later by making a raft of sea turtles - one of his tall tales), and stolen the cursed treasure of Cortes' Aztec gold coins. Barbossa arrived at Isla de Muerta where the treasure was stored in a stone chest, to lift the curse by performing "the blood sacrifice owed to the heathen gods" on the medallion with Elizabeth's blood - chanting: "Begun by blood. By blood undone." But the blood from a knife cut on her hand that was spilled on the medallion had no effect! Will knocked out Jack and rescued Elizabeth (she grabbed the medallion) in the confusion and brought her to the Interceptor while Jack was captured by Barbossa's pirates - and then he bargained with his life, trading his knowledge of whose blood they needed. [The medallion was a gift from Will's father to him, and Will's blood ("the blood of a pirate") was what the pirates really needed.]. After the Black Pearl came upon the Interceptor and sank it, a deal was made: Will was to be taken to Isla de Muerta for the ritual in exchange for Barbossa freeing Elizabeth, although in the end, she was marooned with Jack on an island after they both walked the plank. A signal fire from a cache of rum alerted Commodore Norrington to the island - he then assisted in the rescue of Will (in exchange for Elizabeth's promise to marry him - "as a wedding gift") with the help of the Royal Navy and the HMS Dauntless. The pirates surprise-attacked the Dauntless and conniving Captain Jack became temporarily 'undead' when he stole a coin. Afterwards, Sparrow engaged in a long swordfight duel against Barbossa. Toward the end of the fight, the last two stolen and bloodied Aztec treasure gold coins (pieces of eight) were dropped in a stone chest on Isla de Muerta by rightful heir Will Turner. Temporarily 'undead' Jack had thrown his own secretly-stolen coin to Will, to deposit for him in the chest, to lift the curse and return himself to being mortal. Barbossa pulled a gun on Elizabeth, but before he pulled the trigger, Sparrow shot 'undead' Barbossa in the heart, who thought he was still invincible. He told Jack: "Ten years you carry that pistol, and now you waste your shot." But he was wrong, as Will affirmed while dropping the two coins in the chest: "He didn't waste it." The black-hearted pirate's wound, normally harmless, was now fatal since he had just turned mortal when the curse ended. Barbossa ripped open his coat and glanced down at his bloody chest wound - he uttered: "I feel - cold." As he fell backwards onto the pile of treasures, a green apple rolled from his hand. Will rescued pirate Jack from hanging by the Navy in Port Royal, and he escaped with his freed crew on the Pearl ("with one day's head start"), while Elizabeth's profession of her heart's true love for a pardoned Will was accepted by Norrington. With a production budget of $140 million, the film grossed $305 million (domestic) and $654 million (worldwide). It was the # 3 top-grossing (domestic) box-office hit of the year, behind The Lord of the Rings: The Return of the King (2003) at $377 million, and Finding Nemo (2003) at $340 million. Nominated for five Academy Awards (with no wins): Best Actor (Johnny Depp), Best Makeup, Best Visual Effects, Best Sound, and Best Sound Editing. It was the first Walt Disney Pictures release to receive a PG-13 rating. Set-pieces: Will Turner's swordfight in the blacksmith shop with Captain Jack Sparrow, the transformation scene of pirate Captain Barbossa into an 'undead' skeleton, the attack of the Pearl upon the Interceptor, the underwater surprise ambush of the 'undead' skeletal pirates upon the HMS Dauntless, and the final sword fight between the two "immortals": Barbossa and Sparrow.